Fulham recorded their biggest win in the Premiership this season as they ran riot against lowly West Brom. Heidar Helguson gave the hosts a 2-0 interval lead having drilled in their opener on four minutes and headed home a second five minutes before the break. Tomasz Radzinski fired in the third before Curtis Davies' own goal and Collins John's fine finish made it 5-0. Kevin Campbell stroked in a consolation for the Baggies before John calmly slotted in Fulham's sixth. West Brom had in fact made a lively enough start to the game. But from their first very attack, Chris Coleman's Fulham outfit took the lead when Helguson converted from eight yards following Brian McBride's flick-on. Today should have been a turning point in the season - perhaps it is but in the wrong way.. The Baggies went close to equalising when Nigel Quashie dispossessed Fulham's Simon Elliott and drove at the hosts' back-line on 18 minutes. Quashie, who joined from Southampton in the transfer window, surged towards goal before unleashing a 25-yard drive which went flying just over the bar. At the other end McBride was inches away from extending the home side's lead but saw his close-range effort from Luis Boa Morte's centre saved by Tomasz Kuszczak. Fulham were though able to give themselves breathing space five minutes before the break when Helguson rose highest at the far post to convert Simon Elliott's free-kick to grab his eighth goal of the season. Baggies boss Bryan Robson made a double substitution at half-time as he looked to add more spark to his front line. Williams Martinez was brought on to make his debut, while Nathan Ellington entered the foray to join Kevin Campbell in attack. But the visitors were rocked on their heels again just four minutes after the interval, Radzinski making it 3-0 when he met Steed Malbranque's perfectly-lobbed through ball in the penalty area to score from eight yards. And it was 4-0 when Helguson's strike took a huge deflection off Baggies defender Davies, wrong-footing keeper Kuszczak in the process who could only watch the ball go past him. Fulham were not done yet though, and on 83 minutes substitute Collins John coolly converted Radskinski's left-wing cross. The Baggies were merely playing for pride now and duly grabbed a consolation five minutes from time when Campbell neatly finished Junichi Inamoto's slide pass. But the hosts grabbed their sixth in stoppage time when John calmly slotted home from Radzinski's pass to complete their second biggest win the Premiership after their 6-0 defeat of Norwich last season. "I liken them to strikers I used to play against in my day. They are big strong boys, they attack the ball and don't give defenders a minute's peace. "If we put the ball in the box, they will get goals. They caused havoc at Manchester United last week and did the same today." "I think I have got to apologise to our fans. "We had three-and-a-half thousand fans down here and they gave us great support but it is a pity the players didn't do the same. "My back four up were just shocking. There's no excuse. If you defend like that in the Premiership or any division, you will get beat." 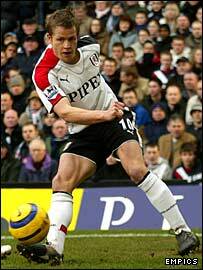 Fulham: Niemi, Volz, Bocanegra, Knight, Bridge, Radzinski, Elliott, Malbranque, Boa Morte, McBride, Helguson (John 64). Subs Not Used: Warner, Legwinski, Goma, Niclas Jensen. Booked: Helguson, Radzinski, Boa Morte. Goals: Helguson 4, 40, Radzinski 48, Curtis Davies 58 og, John 83, 90. West Brom: Kuszczak (Hoult 61), Albrechtsen, Curtis Davies, Gaardsoe (Martinez 45), Clement, Inamoto, Wallwork, Quashie, Greening, Campbell, Horsfield (Ellington 45). Subs Not Used: Kozak, Carter.